Vaci Utca is to Budapest as Oxford Street is to London or as Boulevard Haussman is to Paris. Fashionistas chasing the latest brands will find them in Vaci Utca’s global chain stores. Glamourous ladies will find the ensemble of their dreams in its chic boutiques and the accessories to match in its elegant department stores. 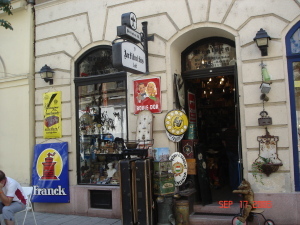 For tourists, or others, seeking something uniquely Hungarian, there are amazing folk art stores. My personal favourites on this street is a fascinating little second hand shop which sells everything from old Dual Monarchy heirlooms to insignia from Soviet uniforms. I lost myself for hours among its collection of faded family photos. At night, when Budapest party people come out to boogie or imbibe in Vaci Utca’s clubs and bars, the whole area hums with life.